Review: Monopoly • Tips, Trends & News in 60 Seconds or Less! 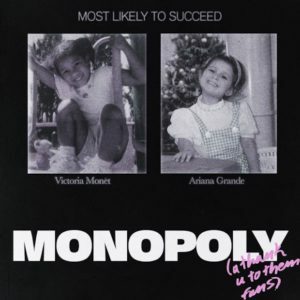 “Monopoly” is Ariana Grande’s latest release, co-starring her close friend, Victoria Monet. Monet has been the brains behind many of the lyrics of Grande’s hit singles, including “thank u, next” and “7 rings.” This song celebrates their latest success of having “7 rings” at number one on the charts for eight weeks. For a song about celebration, it sure does its job. The drums, in conjunction with the use of swing in the artists’ vocals, create a bouncy beat. They also reference the actual game Monopoly: “Treat my goals like property. Collect them like Monopoly. I probably won’t come if there’s not a fee.” The duo compares their goals with the game; in Monopoly, you win when everyone else goes bankrupt through property transactions. Similarly, Grande and Monet are beating everyone else in the music industry by having continuous music successes. In addition, they sing, “I like women and men.” While Monet came out as bisexual, Grande hasn’t defined her sexuality. Overall, the song is short and sweet. Although I believe it does not showcase Monet’s vocals well, Grande sounds spectacular. The message of the song, to be confident in yourself, may also be overused but is important nonetheless. ← Review: Has Panic! At The Disco Changed for the Worse?